LE SUEUR, AMELIA (Yeomans), physician and social reformer; b. 29 March 1842 in Quebec City, daughter of Peter Le Sueur, a civil servant, and Barbara Dawson; m. there 16 Oct. 1860 Augustus A. Yeomans, and they had two daughters; d. 22 April 1913 in Calgary. Amelia Le Sueur was born into an affluent middleclass home where education was esteemed and a gracious lifestyle cultivated. Her brother, William Dawson LeSueur, would become president of the Royal Society of Canada as well as an essayist of note. Amelia was privately educated. At age 18 she married Augustus A. Yeomans of Madoc, Upper Canada, a medical doctor who later became an army surgeon, probably during the American Civil War. After his death in 1878 Amelia and her daughter Lilian both decided to enter the medical profession. In 1879, the year Lilian began studies, no Canadian medical school admitted women students so she enrolled in the University of Michigan’s School of Medicine at Ann Arbor; Amelia joined her there the following year. 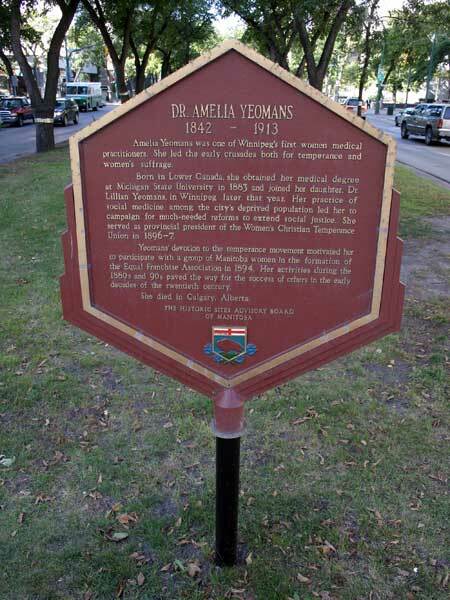 When Lilian graduated she set up a practice in Winnipeg and on her graduation in 1883 Amelia also went west. Both doctors specialized in midwifery and diseases of women and children. For reasons now unclear but perhaps connected with the example of Emily Howard Stowe [Jennings*], who had practised in Ontario for some years without a licence, Amelia did not sit for the examination set by the College of Physicians and Surgeons of Manitoba until 1885, although she appears to have practised medicine from shortly after her arrival in the city. In 1890 her younger daughter, Charlotte, a nurse, also joined them in Winnipeg. Yet, although she decried prostitution and campaigned vigorously against it as well as against a male-dominated political and social system, she was not anti-male, as were some of her fellow suffragists. Indeed, she ministered to all who needed her, men or women. The extent to which this broad-mindedness and her profound Christian faith were appreciated is indicated by a newspaper report of a prisoner condemned to death who requested Dr Yeomans as his spiritual adviser instead of a priest. Appointed president of the Manitoba branch of the Dominion Women’s Enfranchisement Association, probably in 1894, she organized and became the first president of the Manitoba Equal Franchise Association (also referred to as the Equal Franchise Club) in November of that year. 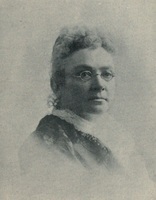 The provincial organization had as its motto, in all sincerity, “Peace on earth, good will towards men.” In her fight for women’s enfranchisement she admitted that “the suffrage has been and is the hardest of all reforms because it demands unselfishness in all men who support it.” Yet she saw equal franchise as part of God’s plan for society. “Christ, when on earth, never gave any example to the men to keep the women silent, for many women followed and helped Christ while on earth.” To have the vote was to have a voice, now denied women, in building society according to God’s plan. And God’s plan also involved temperance. Temperance was closely linked to suffrage in Yeoman’s view since women, the protectors of community morals and purity, would vote against “the liquor traffic.” On 9 Feb. 1893 at the Bijou Theatre in Winnipeg, she served as premier of a mock parliament organized by Mrs Arminda Myrtal Blakely and supported by the Woman’s Christian Temperance Union. Fellow parliamentarians included Nellie Letitia Mooney* and Ella Cora Hind*. “The ballot for women” was debated, with Yeomans arguing that “for the sake of both justice and expediency” as well as for “the best progress of the commonwealth” women must be enfranchised. Although it appeared for a brief time that the women had actually persuaded the Legislative Assembly to grant them the franchise when a resolution to that effect was voted upon and declared carried, the recorded vote reversed the speaker’s decision. 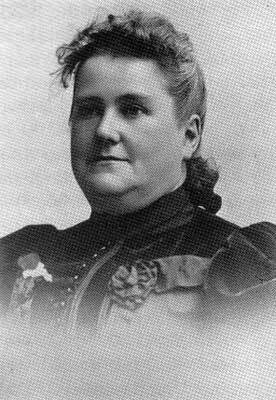 Yeomans was provincial president of the WCTU in 1896–97 and at the time of her death was vice-president of the dominion WCTU as well as honorary vice-president of the Ottawa Equal Suffrage Society and honorary president of the Calgary WCTU. She also served as vice-president of the Winnipeg Humane Society, at that time concerned with neglected children. In her crusade for political and social change Yeomans was supported and often accompanied by her good friend journalist E. Cora Hind. In 1904 Charlotte obtained a nursing position in Calgary and the following year Amelia joined her there. In 1906 Lilian joined the family. Neither Amelia nor Lilian resumed a medical practice. Although Amelia continued to be involved in many activities and speaking engagements, she was not well, suffering from diabetes. She died in Calgary and her burial service was held from the Church of the Redeemer. ANQ-Q, CE1-68, 29 mars 1842, 16 oct. 1860. PAM, MG 10, B36; C31. Univ. of Man., Faculty of Medicine Arch. (Winnipeg), Biogs., 12.1/124-043. Calgary Herald, 1 July 1897, 23 April 1913. Manitoba Free Press, 10 Feb., 24 March, 16 June 1893; 24 Nov. 1894; 11 July 1898; 28 April 1899; 25 March 1901; 24 April 1913. Canada Lancet (Toronto), 46 (1912–13): 858. Canadian men and women of the time (Morgan; 1898). C. L. Cleverdon, The woman suffrage movement in Canada, intro. Ramsay Cook (2nd ed., Toronto, 1974). Carlotta Hacker, The indomitable lady doctors (Toronto, 1974). A harvest yet to reap: a history of prairie women, intro. Candace Savage, comp. Linda Rasmussen et al. (Toronto, 1976). E. C. Hind, “Dr Amelia Yeomans,” Manitoba Messenger (Winnipeg), June 1913: 9 (copy at PAM). Manitoba Culture, Heritage and Recreation, Hist. resources branch, Dr Amelia Yeomans ([Winnipeg, 1985]). Pioneers of Man. (Morley et al.). Vera K. Fast, “LE SUEUR, AMELIA,” in Dictionary of Canadian Biography, vol. 14, University of Toronto/Université Laval, 2003–, accessed April 22, 2019, http://www.biographi.ca/en/bio/le_sueur_amelia_14E.html.